King Cryos: This is madness!! We re-enter the universe of planets Fire, Rock, Bone, and Ice in this next volume of ADV's Shadow Raiders. In their quest to save their worlds from the deadly Beast Drones, the leaders are as united as they'll ever be, and decide that the time has come to fight the Beasts head-on. No one is truly sure who to trust, but they really have no choice: the time has come to ignore personal problems and focus on the war at hand. Unlike previous volumes, this disc contains 5 rather than 4 episodes in order to accommodate both parts of the first season finale, Ragnarok. We begin with Rock and Ruin, in which King Cryos, Emperor Femur, Prince Pyros, and Tekla attempt to convince Lord Mantle, ruler of Rock, to join the alliance against the Beasts. His stubborn refusal to make peace with the other empires threatens the universe, but Femur and Tekla think they may have a way of convincing Mantle. They decide to steal the powerful Battle Moons that protect Rock, thus leaving them open to attack. They assume that once Mantle has been attacked by the Beasts, he'll acknowledge the need to band together, but will it work? Surprisingly, for a television series based on the War Planets toys, this is the their (the Battle Moons) first major appearance in the series. In Against All Odds, Prince Pyros is given the responsibility of bringing King Cryos' daughter, Lady Zera, back to Planet Ice. On the way, however, they're attacked by Beast Drones and their ship crashes on the dead moon, Remora. While Cryos, Graveheart, and the rest of allies are searching for them, they make the discovery that Remora is the secret base of the Beasts. They attempt sabotage, but find themselves in too deep and badly in need of help. Meanwhile, Princess Tekla tries to use knowledge she absorbed during her possession by Lamprey (leader of the Beasts) to uncover weaknesses in the Beast Empire. Uneasy Hangs The Head sees Rock warrior Graveheart having a problem with his conscious. Tired of fighting, he attempts to resign as leader of the official alliance, only to meet with great opposition from his comrades. Any viewer that has been watching this series since the beginning can quite literally skip this episode. It's basically one of those "in case you came in late" shows where we see flashbacks to previous situations and story elements. It tries to bring newer viewers up to speed on a few things. Nothing important happens (other than a minor revelation as to why Graveheart hates fighting), and it's pretty boring if you already follow the story. Ragnarok I and II sees the alliance of planets finally deciding to launch an all-out offensive on the Beasts. Now that they know Remora is their base, they strike with all their power. Unfortunately, Lamprey and her underlings have a few tricks up their sleeves in order to counter the offensive, and the battle will only serve to deepen the conflict. This epic clash marks the end Shadow Raiders' first season, and it also leaves us with a more urgent situation at hand, which will be revealed to the viewer. The most noticeable thing about this disc is how these 5 episodes have really ramped up the action and excitement. Other than the dramatics of Uneasy Hangs The Head, there's way more stuff going on here than usual. Ragnarok is especially good, as it's virtually non-stop action. The central story finally established, the series moves much faster here as well, focusing more and more on pure adventure. I was actually surprised at how intense the series has gotten, especially since it was intended as a kid's show. With all the good things, though, a few cracks are beginning to show. The dialogue really isn't as good as it was in the early shows; characters don't seem to be quite as natural as they once were, but are now locked into specific ways of speaking and attitude. Much of the repetitive sentiments of the characters begins to get a little annoying—in fact, this is even slightly made fun of in Uneasy Hangs The Head, so perhaps the second the season acknowledges this minor problem. Also, the series has too many similarities to other movies and shows for comfort. Now, it's nothing major, but the comparisons between what goes on in this volume and the events in Star Wars are just too obvious. Let's just say there's a slight bit of originality lacking here. 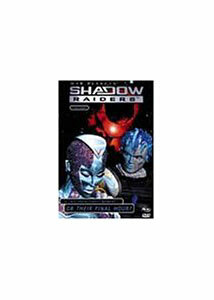 Regardless, Shadow Raiders gets more entertaining as it moves on, thanks to the faster pace. Image Transfer Review: As with previous volumes, nothing about the image quality is changed. Expect the usual level of great quality and crystal clear computer imagery. No complaints here. Audio Transfer Review: Given that the action has been kicked up a notch, so has the audio. Since there's so much stuff going on (including the huge space battle in episode Ragnarok), expect some good front directionality and healthy usage of the surround channels for some ambience and direct sound effects. Everything sounds good and the mix is generally exciting. Extras Review: Like previous discs, we get fictional bios of series characters, this time from Planet Bone. There are also technical documents about some Bone technology, and a reel of test render footage of locations on Planet Bone. ADV trailers are also featured, as well as the series preview for Shadow Raiders. Whether you choose to rent or purchase, this series is still an entertaining bit of sci-fi. It's also a good family show, as long as your kids are sufficently mature enough to handle certain themes of violence and death. ADV keeps up the good work.